The LA Times recently released an article about 11 hospital patient deaths at Huntington Hospital in Pasadena. The killer? Medical scope mismanagement. The outbreak began in January 2013 and continued until August 2015, resulting in 16 infected patients, including 11 who have since died. While only one of the 11 death certificates lists the bacteria found on Huntington’s medical scopes as the cause of death, these mortalities reveal the dangers of improper medical scope management. The particular type of scope at fault is the Olympus duodenoscope. All duodenoscopes feature a tiny camera on the end, and are inserted into the throat and upper gastrointestinal tract. Due to their tubular and long design, they have a history of holding onto bacteria. Last winter, the mismanaged duodenoscopes took the lives of four others in California and North Carolina. This past January, Olympus recalled one model of its reusable duodenoscopes because the potential to transfer bacteria between patients was too high. Two of the scopes responsible for the Huntington outbreak were an older version of this recalled scope. While the inherit nature of duodenoscopes appear to pose an infection risk, they can also improve and often save the lives of many patients if managed correctly. The standard for cleaning endoscopes was updated in May of last year, titled: ANSI/AAMI ST91:2015, Comprehensive guide to flexible and semi-rigid endoscope processing in healthcare facilities. It goes into extensive detail about the processes of cleaning, sterilizing, and disinfecting endoscopes as well as endoscope pre-cleaning, leak-testing, packaging and storage, which were often left to each individual healthcare facility’s unique operating procedures. So, it’s the responsibility of healthcare facilities to properly manage their medical scopes so that their patients receive the care they need and avoid infection risk. To reduce future infection, healthcare facilities must first and foremost take a look at the reprocessing and storage of their endoscopes when they aren’t being used. In order to avoid risk from organic matter or bio-burden left on the endoscope, it’s important for these endoscopes to enter the first stage of reprocessing within a very short period. A Clinical-Grade Real-Time Location System (RTLS) can automatically track and create alerts through every stage of this cleaning process. Staff immediately know when endoscopes need to be cleaned and are instantaneously notified of any possible infection risks. With the potential for wide-spread disease and the risk of infection with these devices, it’s crucial for healthcare facilities to have the ability to track the storage, usage and cleaning life cycles of every endoscope. By utilizing miniature, durable tags capable of withstanding High-Level Disinfection (HLD), a healthcare facility is able to easily and safely monitor scopes through their usage, cleaning and storage life cycles and improve patient safety. 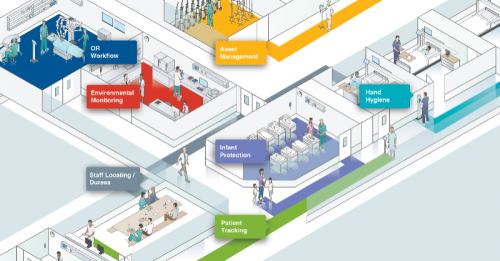 Clinical-Grade RTLS systems could enable healthcare facilities to know which scopes should be used first in order to maximize workflow and avoid unnecessary washing and disinfection that can be harmful to the device’s structure. CenTrak offers the DuraTag – a small, extremely durable tag specifically designed to be attached to the neck of medical scopes. This way all critical steps of scope reprocessing can be managed and optimized to improve efficiency, reduce loss and most importantly keep patients safe. To learn more about clinical-grade endoscope management solutions and how they can improve patient safety and reduce enterprise-wide infection risk, visit our Medical Scope Management System Page or download CenTrak’s Medical Scope Management Overview.